As many cities in Asia are, Bangkok is a contrast of old and new. Most come to see the past, the beautiful temples and river life, much the same as they started. But this city is also one of progress, with a stellar transportation system, energetic cultural scene and beautiful new buildings. To really experience Bangkok today, it is necessary to forget all expectations and take this city as it comes. After a short meeting with your guide, you will set out to visit the highlights of the city. The first method of transportation will depend on the location of your hotel and will be by Skytrain, Chao Praya River Express or a taxi. Best to see the Grand Palace including the Temple of the Emerald Buddha first if possible to avoid crowds. nown also as Wat Phra Kaey, this is a fairy-tale compound includes the former residence of the Thai monarch and a large emerald in the shape of Buddha. This location proves best for the next major attraction, one unique to Bangkok, a klong canal tour. Along the river and canals stemming from the Chao Phraya River you will get a view of river life like no other. Homes, trading houses and temples remain oriented towards life on the water and this boat trip will provide a fascinating glimpse into the past when Thais considered themselves water lords. 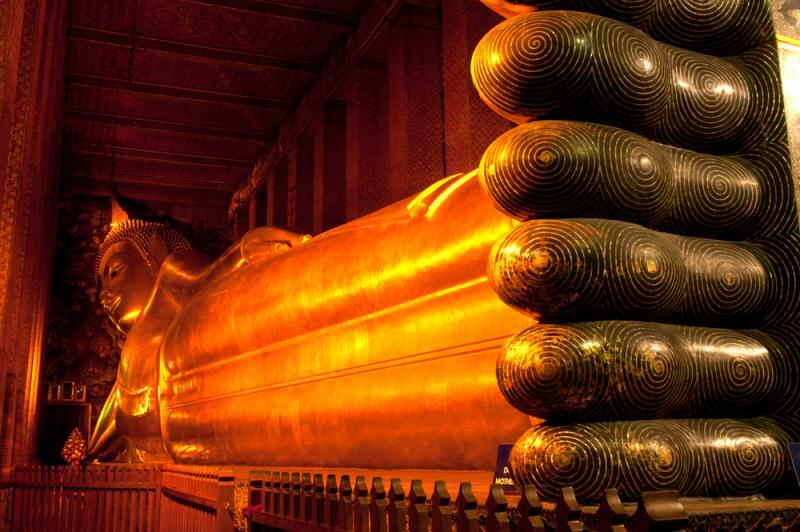 One unforgettable site is the Reclining Buddha, known as Wat Pho. This compound incorporates the impressive Buddha, 46 meters long and 15 meters high, illustrating the passing of the Buddha into nirvana. It also is the national headquarters for the taching and preservation of traditional Thai medicine, including massage, which makes for a second interesting stop. Finally, the city of flower markets requires you to visit one during your stay. The market we have chosen is the largest depot for wholesale flowers. Whether you stop first thing in the morning or late at night, deliveries will be arriving. Local snacks are a possible option here. Time has been set aside for a local lunch, which is not included in the cost. This full day in Bangkok will easily be a winner. - Lunch is not included and you are expected to buy your guide lunch. Cost will be about $15 per person. Lunch will be at an air-conditioned Thai restaurant with a menu that includes dishes for vegetarians, children and those not comfortable with Thai food. - Admissions are included in the price of the tour. - You will have options for transportation in most cases which include Skytrain, Chao Praya River Express or a taxi. All are inexpensive. In the case of more than 2 guests in your party, you will use multiple taxis if necessary. Transportation fees aren't included in the price of the tour. - ATMs and money exchange places are plentiful and your guide will help you locate one if need be. - The entire Grand Palace is closed during special royal ceremonies and during the visits from foreign heads of state, while other buildings, such as the Throne Hall and Coronation Hall are always closed on Saturday and Sunday and public holidays, special ceremonies and Buddhist holidays. 10:00 AM, duration: 6 hours Contact ShoreTrips before booking to adjust the start time of this tour.